Jennifer Kistler Studios art & life: shipping changes & new blog home! Hello! I am an artist, jewelry-maker, mama to two boys, and former Oregonian now living in Arizona. Welcome to my home on the web! If you are considering some jewelry for your holiday shopping (or want to treat yourself! ), please visit my Etsy shops: gemstone jewelry, and my original nature designs in silver. Now through January 15 2017, I am offering free domestic shipping in the United States (insured Priority Mail as usual) on orders of $100 or more. Enter this code when checking out: 100FREESHIP If you wish to combine items from both my jewelry shops to meet the free shipping minimum, I need you to please contact me through Etsy before purchasing, and I can arrange for that! Also, I have added shipping to Canada in both Etsy jewelry shops. It is insured First Class and seems to arrive in a very reasonable amount of time. If your purchase totals $100 or more, I will refund a comparable portion of your shipping charge as would've been taken off for free domestic shipping during this offer (through 1/15/17). Again, if you wish to combine items from both shops to qualify for reduced shipping, you need to contact me through Etsy before purchasing. 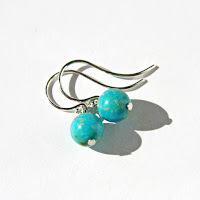 Shown above is one of several new pairs of petite Kingman Turquoise earrings recently added to the shop. 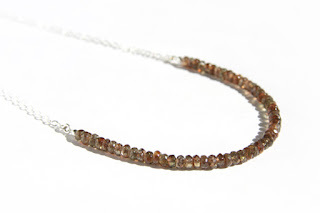 I also have a new necklace style in the shop, shown below, you can read more about them at my new blog. Have a wonderful holiday season, thank you for your interest in my work, and if you have any questions, be sure to let me know! See you at the new web site and blog! Content and images copyright Jennifer Kistler. Not to be used without express permission. Simple theme. Powered by Blogger.